Enterprises are often held back by an inflexible and complex IT infrastructure that cannot keep up with the new application and service demands of an increasingly distributed workforce. These constraints result in slow rollout of critical applications and services, limited resources, poor operation visibility and control, and unpredictable system integration. For many IT groups, cloud computing provides a solution to these challenges. The Cisco® Unified Data Center platform was designed specifically to overcome the current data center constraints and provide agile, simplified, and efficient IT service delivery and cloud computing. The innovative platform facilitates virtualization, simplification, automation, and accelerated delivery of cloud applications and services to provide a sustainable business advantage. 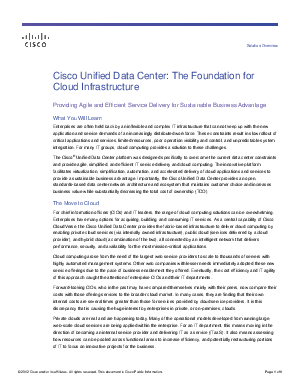 Importantly, the Cisco Unified Data Center provides an open, standards-based data center network architecture and ecosystem that maintains customer choice and increases business value while substantially decreasing the total cost of ownership (TCO).